Some years ago an English woman who had the gift of being able to understand animals came to my shelter in Delhi. Walking up to a cow, she turned to me and said  She says that her head still hurts  The woman did not know that the cow had been in an accident. When you next have a steak or wear new leather shoes , remember that this cow could articulate her pain. We are just not smart enough to understand her voice. John Webster, professor of animal husbandry at Bristol, has just published a book on the topic, Animal Welfare: Limping Towards Eden. People have assumed that because animals have smaller brains they suffer less than humans. That is a pathetic piece of logic, he says. Just because a cow moves slowly , that really doesnt make her stupid. In fact cows are intelligent and curious beings who enjoy solving problems . They have long memories and are capable of learning lessons from each other, just as humans do. Donald Broom, professor of Animal Welfare at Cambridge University, describes how cows are excited by solving intellectual challenges. In one study, researchers set cows with a task where they had to find how to open a door to get some food. An electroencephalograph was used to measure their brainwaves.Their brainwaves showed their excitement; their heartbeat went up and some even jumped into the air when they found the solution. Research has shown that cows clearly understand cause-and-effect relationshipsa sure-fire sign of advanced cognitive abilities. For example, cows can learn how to push a lever to operate a drinking fountain when theyre thirsty or to press a button with their heads to release grain when theyre hungry. Like humans , cows also quickly learn to stay away from things that cause them pain, like electric fences and unkind humans. Cows dont forget lessons that theyve learned. They have impressive memories. They remember their homes and can find their way back to their favorite spots ( which is more than I can !). They remember where things are located, migration routes, watering holes, shelter and the location of their newborn calf. Researchers also report that cows can remember the best eating spots in a pasture many months later. Stories of cows who used their navigation capabilities to find their way back home after being sold at auction are common. Some cows never forget those who have hurt them either, and theyve been known to hold grudges against other members of their herd. Rosamund Young details a quarrel between a grandmother cow and her daughter. Grandmother cows often help their daughters with mothering duties, but a cow named Olivia wanted no part of that. She ignored her mothers offers to help groom her. Offended, her mother finally marched off to another field to graze with her friends and never spoke to her daughter again. A herd of cows is very much like a pack of wolves, with complex social dynamics. Each cow can recognize more than 100 members of the herd and herd leaders are chosen for their intelligence, inquisitiveness, confidence, experience, and good social skills, while bullying, selfishness, size, and strength are not recognized as suitable leadership qualities. Webster has documented how cows within a herd form smaller friendship groups of between two and four animals with whom they spend most of their time, often grooming and licking each other. The relationships between mothers and daughters are especially strong, and calves play with other babies. They like to sleep near their families and when the herd settles down for a nap, each cows position and the order in which they lie down is directly related to their status in the herd. Raising cows in crowded lots, is very stressful to them . University of Saskatchewan researcher Jon Watts notes that cows who are kept in groups of more than 200 get confused , scared and constantly fight for dominance . This is akin to how humans would feel if we were penned in a tiny space with thousands of unfamiliar people. Just like us, cows like to be near their families and friends. Cows are emotional animals who have likes and dislikes, just like humans do. The chairman of the National Farmers Union in the United Kingdom, Tim Sell, explains, They have emotional upheavals. When it is a miserable, cold day, they will all be miserable, but when it is nice and sunny, you can almost see them smiling. Cows use their body posture and vocal sounds to express a whole range of emotions, including contentment, interest, anger, and distress. They mourn the death of those they love, even shedding tears over their loss. With kind treatment, cows can be very loyal companions. In her book Peaceful Kingdom: Random Acts of Kindness by Animals, Stephanie Laland writes that when the Rev. O. F. Robertson began to go blind, his cow Mary became his seeing-eye cow. Mary would walk along with him, nudging him away from obstacles. She accompanied Robertson everywhere he went for the rest of his life. When they are separated from their families, friends, or human companions, cows grieve over the loss. Researchers report that cows become visibly distressed after even a brief separation.The mother-calf bond is particularly strong, and there are countless reports of mother cows who continue to frantically call and search for their babies after the calves have been taken away and sold to butchers. They stand in acute grief outside the pen where they had last seen their babies and bellow for days, moving when forced to do so. Weks later they will still return to the same spot to see if their calves have come back. Like all animals, cows value their lives and dont want to die. Stories abound of cows who have gone to extraordinary lengths to fight for their lives. A cow named Suzie was about to be loaded on a freighter when she turned around, ran back down the gangplank, and leaped into the river. Even though she was pregnant she managed to swim all the way across the river, eluding capture for several days. She was rescued by PETA and sent to a sanctuary for farmed animals. When workers at a slaughterhouse in Massachusetts went on break, Emily the cow made a break . She took a tremendous leap over a five-foot gate and escaped into the woods, surviving for several weeks in the snowiest winter. When she was eventually caught , public outcry demanded that the slaughterhouse surrender her to a sanctuary where she now lives happily. Eating meat means eating animals who dont want to die. In the U.S., more than 40 million cows are killed in the meat and dairy industries every year. When they are still very young, cows are burned with hot irons , their testicles are ripped out of their scrotums , and their horns are cut or burned offall without painkillers. Once they have grown , they are sent to massive, muddy feedlots to be fattened for slaughter. 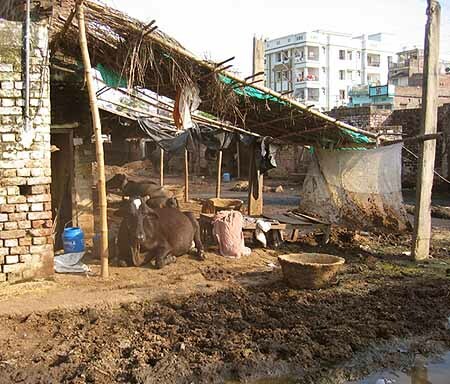 Millions of cows living in dairies spend most of their lives either in large sheds or on feces-caked mud lots where disease is rampant. Cows raised for their milk are repeatedly impregnated, and their calves are taken from them and sent to veal farms or other dairy farms. When their exhausted bodies can no longer produce enough milk, they are sent to slaughter. Every night , in India, we see trucks crushed full of cows going for illegal slaughter. Many cows die on the way. The rest are taken onto the killing floor, where their throats are cut and they are skinned in front of each other. They die piece by piece. Every time you choose to buy leather or drink milk you kill a gentle intelligent sensitive being. Cows are not just oblivious. 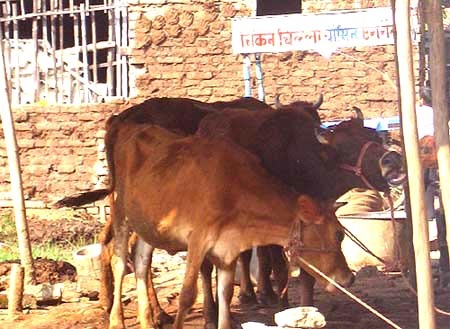 cud chewing milk machines  those terms can be more aptly applied to so many humans instead. Thank You Madam for this wonderfull article on Propensities of Cow Human and thanks you editor to benefit readers with such topics on prestigious Bihar Times .